Houghton Mifflin Harcourt, 9780547195957, 280pp. In Perfect One-Dish Dinners, the New York Times best-selling author Pam Anderson shares her secret for having people over without breaking stride: Make just one dish. Instead of a parade of offerings, she focuses attention on a single main course--a rustic tart, paella, grilled platter, or homey stew. 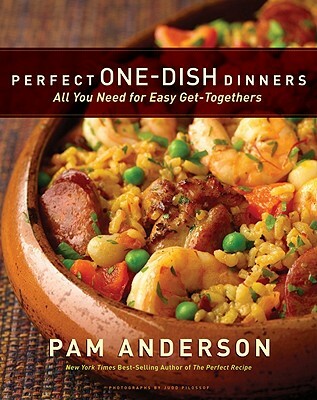 Perfect One-Dish Dinners showcases about forty such meals, perfect for every season and occasion, all designed to wow guests, calm the cook, and relieve the dishwasher at the end of the night. Stews for All Seasons Worldly Casseroles Roasting Pan Complete Big Summer Salads and Grilled Platters But that's not all. If the cook wants to make something extra, Pam provides a compatible appetizer, salad, and dessert for every one dish. And as a special bonus, she throws in "nearly instant" alternatives for each--more than 200 mixable, matchable recipes. Whether for a book group, church get together, birthday party, or family supper, Perfect One-Dish Dinners makes easy, shareable meals perfectly doable. "Pam Anderson's cookbooks have lived on my shelves for years and years---long before I ever had the idea to write one myself. Her elegant but reassuringly approachable style of cooking inspires both foodies and home cooks alike. Pam makes you feel like you can cook anything, and with her help, you can!